"ELVIS IS IN THE BUILDING"
This is a man who has performed more encores than the King himself, and it must be said with almost as much experience. 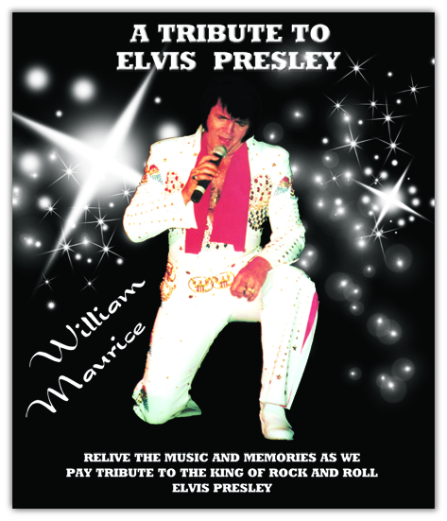 Having earned some of the highest credits from some of the most acclaimed there is no doubt that William's Tribute is an opportunity that should not be missed. Having completed the European Tour "Dreams" that spanned almost 4 years is only one of his most recently added credits. He also performed in 1994 for Her Majesty Queen Elizabeth, who claimed to have thoroughly enjoyed the evening. His World Tour of the "Rock & Roll Memories" was acclaimed to be A Smash Hit. Watch for William in the new Londontown Musical "Angels & Kings.